Ben Stirling is a Game Development producer at Guru Studio in Toronto Canada. He also has a little boy who just turned one year old. I can relate. My son also turned one year old last week. I bought my son a little mini drumkit, but Ben's present was way cooler — he placed his son in all of the video games! For example, Mario Kart where he — of course — placed first. I don't know how he made it into Left 4 Dead. This is some seriously irresponsible parenting here. THERE ARE ZOMBIES EVERYWHERE! Ah… LittleBigPlanet. That's a bit more suitable. DEAR GOD ALMIGHTY — WHY IS HE FIGHTING LOCUSTS? 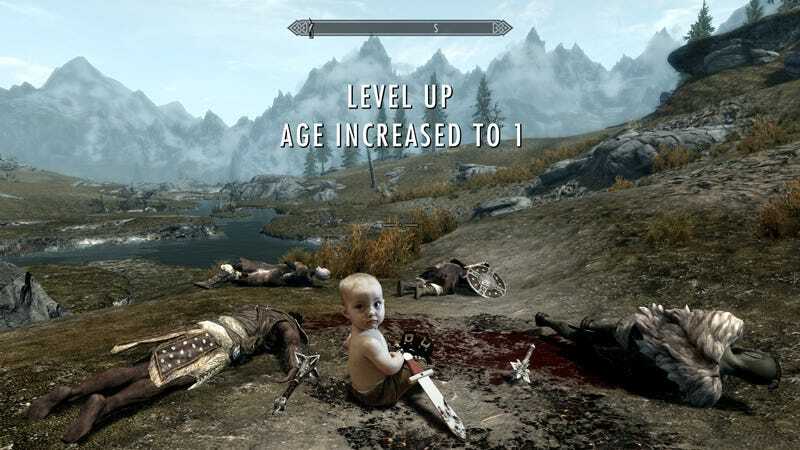 How can a child survive in the harsh climate of Skyrim. There's snow everywhere — put some clothes on this guy! Portal is cool though. A nice, sterile safe environment for a child. I wonder if GlaDOS is up for running a daycare service. SIGN ME UP. But yeah, the Mass Effect one is my favourite. I can relate to this level of communication. Okay, I think that's enough cute for one day. Forgive me. I am a father now, I'm susceptible to this kind of stuff now!